This is the very first release of Leopard Server. As the retail consumer version, this software contains BootCamp in his final primary version. 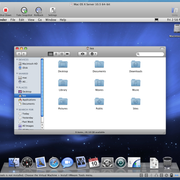 The original disc has also a Win partition for it. Languages supported by this software: English, French, German and Japanese. Excerpt from Wikipedia: Leopard Server includes FreeRADIUS for network authentication. It ships with support for wireless access stations however can be modified into a fully functioning FreeRADIUS server. So, I tried using Software Update on Panther (Server), and it would say there are no updates even when I wasn't using the most updated version, so yeah, it indeed has become a problem. You can still find and download the files manually from Apple's Support page, though. I half suspect the reason it fails now is because Apple likely requires a more updated version of TLS to navigate in that page than they did before, and Panther doesn't support it? In any case, the danger is very real, as we all knew. Edit: Both Panther Client & Server are affected. I tested Tiger again, and it still works as of now, but who knows for how long. Added a zip of patches available that maps closely to what you'll find from Software Update. Figured it was good to have them archived before Apple takes down the patches from their servers, much like they did recently for Tiger. Thank you, The Unarchiver worked, now just need to find something each of these will fit on to install with, don't really want to go buy a load of dual layer DVDs if I can avoid it. the files are zip segments that need to be joined again for inflating them. The Unarchiver does that perfectly, the build hosted here should work with 10.3.9 or higher. Navigate to the fourth tab "Utilities" for The Unarchiver, please. 7ZX may be an option too and you always can join and inflate the downloads on a Windows PC with 7Zip. I wonder if someone could help me with these files. I thought it would be interesting to put a copy on my g5 to see what I could do with it. I've downloaded the files but they didn't seem to be zip files as there is a number on the end of each one, so I removed the numbers and I was able to extract them but when I try to mount one it fails and says it's not recognised. I am probably doing something stupid here, any recommendations would be great. Thanks again for sharing this huge cdr! I´m installing the OS in VMWare as I´m typing. 10.5 Server is a real great addition, if alone for the ability to write HFS from userland - e.g. to a floppy drive connected via USB. For now, it does not seem needed to me, adding a ready made virtual machine. Its only twenty minutes to set it up from cdr. YW. Ten parts have been created. So, there is one or two remaining now. Not so difficult for me when the bandwidth works well. No problem for your addition. Obsolete for Leopard in a virtual machine inside ? Thanks for going through this gruesome task, MacTouch! How many chunks did you create? Once you are through with uploading, I might be adding a ready made VMWare instance to the page. The VMWare thing may be obsolete though, as it will be easy enough to set up from scratch. Indeed, I have corrected that... Thanks.